Lamar Fisher 1926-2009: Soldier, father, teacher. Author’s note: When I first entered the Nibukikan in late 1975 or early 1976, Prof. Lamar Fisher – then a hachidan – confronted me with skepticism. “Why do you want to study jujitsu,” he asked gruffly. His tone was hardly inviting. And that may be why I stayed. At the time, I was pursuing a degree in Eastern Religious studies. I was tired of studying about zen. I wanted to practice it. I had read about students who sat outside of monasteries for months before they were admitted. I recall that one even cut off his arm to show his sincerity before the teacher would take him in. I wanted the real thing, not one of those contract dojos that hands out rank in exchange for monthly dues. Prof. Fisher sure seemed like the real thing. He could simultaneously terrorize me (those thumbs demonstrating the location of the sciatic nerve, for instance) and make me feel at home with his mischievous smile. Dues were just $7.50 a month back then. If you couldn’t pay, you were supposed to sweep the floors or contribute some other way. Prof. told practically everyone where the key to the dojo was kept. Anyone who behaved and wanted to study jujitsu was welcome to crash there. I was one of several vagabonds who literally lived in the dojo for weeks or months between wanderings. Prof. Fisher created a home for us, and we felt like family. 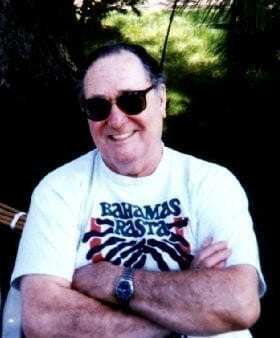 Senior Prof. Lamar Fisher was born in Chico, Calif., on April 25, 1926. His brother Melford (who now lives in San Jose, Calif.) followed 2 ½ years later. Prof. describes their childhood as “kind of hectic.” The family “bounced around” between farms in Princeton and Orland, Calif.. But Prof.’s fondest memories were from the family ranch in Anderson, situated in California’s Great Central Valley south of Redding. “That’s where I got the tractor stuck,” he said in a recent interview. Prof. learned to drive at an early age so that he could help his dad on the farm. He was only about 12 when his dad asked him one day to disc the prune orchard. He climbed aboard the Caterpillar, but he wasn’t too good at operating the tracks that both drove the machine and made it turn. He got going too fast and soon found himself in a slough. His father was mad because he had to stop work to pull the Cat out of the ditch, but he didn’t say anything. The incident was soon forgotten, and before long Prof. was running errands for his dad in the family’s Dodge pickup. Prof. finished grade school in Chico at the old Central School, and then went on to graduate from Chico High. He said he had no trouble in school, and seldom took home a book or studied. “All because I guess that I could remember everything that the teacher said,” Prof. explained. It was in high school that Prof. honed his physical coordination and balance. He loved gymnastics, tumbling and “hand balancing,” a kind of acrobatic gymnastics similar to floor exercises and often seen in circus acts. But Word War II broke out in his junior year, cutting short his gymnastics training. “I knew that I was going to be in it, so I took some extra classes and I got out in three and a half years,” Prof. said. He got drafted into the Army in 1944, leaving Melford to pickup his diploma for him. After basic training, Prof. tried to get into the paratroopers, but was rejected because he wore glasses. “So the next job I tried to get into, I took my glasses off, and I got in. That was the Rangers,” he said. “At the time, they didn’t need any more Rangers, so they put me into 25th Infantry.” The Division got the name Tropic Lightning because of its intense fighting in the Central Pacific, Guadalcanal, the Northern Solomons and Luzon. Prof. participated in the Division’s Philippine campaign at Luzon and Leyte. The 25th Infantry Division landed at Luzon on Jan. 11, 1945. Prof. does not belabor the details of the campaign. But you can get an idea of what he went through by reading the details at www.grunts.net: The Division, led by Gen. Charles L. Mullins, “landed in the San Fabian area and drove across Luzon’s central plain to crash full force into the enemy at Binalonan. In swift succession the Division captured Umingan, Lupas, and San Jose, destroying the Japanese tank force on Luzon. “Tropic Lightning flashed through Digdig, Putlan, and Kapintalan despite ferocious Japanese counterattacks. In the spring of 1945 the Division headed for the knockdown fight at Balite Pass, key to the Cagayan Valley. Elsewhere in the Pacific, Leyte was secured and the Marines had provided a fighter base within 400 miles of the Japanese heartland by capturing Iwo Jima in March. The new 10th Army held Okinawa. Asked if he saw any action, Prof. chuckled. “Well, a little bit. Yeah. It was hand to hand, at times,” he said. “All I can say is, we were trying to survive. “I had two campaigns in World War II, Leyte and Luzon. Luzon was the biggest one. That’s where I got hit, got my purple heart. It’s not the finest thing in the world to be in combat, but that was my task. That was my job, and I had to do it. Prof. is still stung by the fact that the record was not recognized. Gen. Douglas MacArthur decided that because part of the period included a “mopping up” operation rather than a sustained assault, it shouldn’t be cited. “So, in essence, we got screwed,” Prof. said. “A hundred sixty-five days in combat is a looonnng time. And no other outfit had that record in World War II. Our commanding officer, Gen. Mullins, was bucking for another rank himself, and he kept pushing us, which is Ok. It didn’t do any good to complain. “Here you are in a front line, getting shot at, nobody is going to relieve you. I don’t know whether you know where the Leyte Pass is or not. It’s the pass that goes on to Luzon, Baggio to the Cagayen Valley. “Here we are, sitting up on what we call a ridge. And I notice one day that there’s this light flashing, somehow or another, down in the valley. We had our artillery spotter up there. I said, ‘What the heck was that?’ …And I happened to have a pair of field glasses. We checked it out. We couldn’t see anything. So we decided well, let’s check it out, find out what the problem is. So we called the battery and ask him to send in a round. “And the guy said we can’t do it until the major gets back from his chow. Ok. I said to call back. And he did. And the major said, ‘Ok, what’s the coordinates. We gave them to him. He sent in three rounds. They were real high and off to the left. “So he sent in another three rounds and that place went up sky high. We hit an ammo company. And that’s what they were doing, they were taking out the ammo from that dump. And they knew that we were on their tail and wanted to get it [the ammo] out. “And I don’t care what MacArthur said. Our guys were still getting killed. I don’t know how many guys we buried. But there was over half, half of what we had up on the ridge. Prof. picked up a souvenir from one of his battles: An exquisite Japanese sword, taken from the corpse of what appeared to be Japanese officer. “I thought at the time it would make a whole bunch of hunting knives,” Prof. says with a chuckle. That was before he began studying Japanese martial arts and culture. The 25th Infantry prepared to join the invasion of Japan. Prof. was to be in the third wave going in. But the dropping of atomic bombs on Hiroshima and Nagasaki ended the war early. Prof. joined the occupation forces in Japan. Prof.’s first real exposure to martial arts – other than his hand-to-hand training in Ranger school – came during the occupation. He asked a Japanese man working as a translator if he knew anyone who practiced martial arts. The man said his cousin did, and Prof. asked him to arrange a demonstration. Prof. and the translator met outside the base one Sunday and they walked about a half-mile to his cousin’s house. When Prof. got permission to enter, he found the sensei sitting on a stump or a stool. “There was a kid, must’ve been about 15, 16, something like that. And all he [the sensei] said was, ‘Now!’ And I don’t know, we did about … three or four techniques. And at that time, I had no idea what the heck it was. But later on, when I looked at it, it looked more like aikijutsu, and I guess that’s what it was. I don’t know. I’m not really sure,” Prof said. He said it was effective, but that’s the only lesson he got in the martial arts until he met Bud Estes in Chico after the war. Prof. spent a year in Japan. The Army wanted to keep him, especially after administering the Stanford-Binet IQ test. Prof. said he scored 138, or “very superior.” He was a staff sergeant at the time, and he figured the Army wanted to put him through Officer Candidate School. “I had had enough of getting shot at, so I said no thank you. All done. So I got my discharge and went to college,” he said. 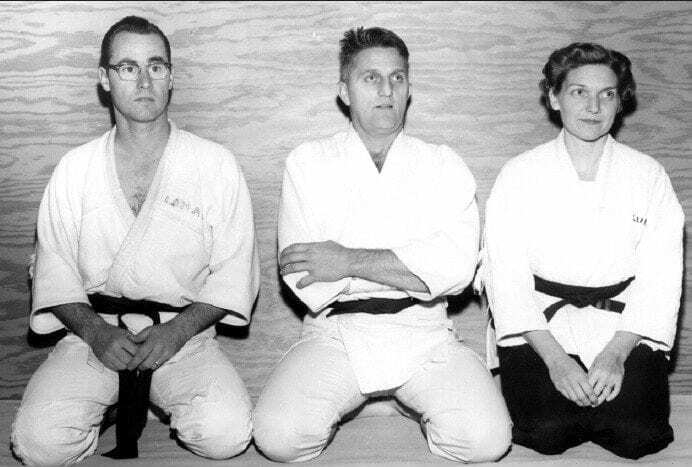 Prof. was taking business classes at Chico State College (now called California State University-Chico) and helping to teach class there when he first heard about Bud Estes’ jujitsu dojo at the Chico airport in 1948. Prof. tagged along with a friend. He found a half dozen people practicing on three portable 4-foot by 8-foot mats. “After I met Bud, I never went back to any of the college classes at all in the gymnasium,” Prof. said. 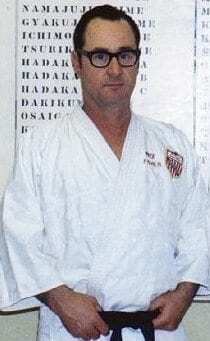 Prof. Estes promoted him to shodan in just 13 months, in January 1950. “At that time we didn’t have exams. He felt I was qualified, so he gave it to me,” Prof. said. Prof. graduated in 1950, and met Betty Grenfel that summer. She was from San Jose and she was staying with her grandfather in Chico. “And the rest of it is history,” Prof. said. “So that’s what Bud and I did. When anything came up about the federation and it came down to a vote, we decided among ourselves and between ourselves how we should go about it, and then he made the vote. And that was it. We never, ever had a problem discussing anything because we were both open-minded enough to look at both sides – any direction, many directions,” Prof. said. The AJJF was not all that cohesive at the beginning, he said. “Because Ray Law for a long time was, you know, well, he was a kind of a knothead. He was just stubborn. Not only stubborn, but he was at a point where it’s going to be this way, or not,” Prof. said. Prof. Estes wanted to call the first gathering the first AJJF meeting, so everyone agreed, Prof. Fisher said. Along with helping to raise the AJJF, Prof. and Betty collaborated on the raising of three sons: Dennis, Gary and Marlin. They now have nine grandchildren, 18 great grandchildren, and just recently added a third greatgreat grandchild. None of the boys wanted to practice jujitsu, Prof. said. “I tried to get them involved and they wouldn’t really have anything to do with it,” he said. “I guess they felt that because dad had so much rank, and … I’m not sure, I guess they felt that I had too much prestige. Prof. never tried to make a living at the martial arts. It was his avocation and his passion. His first job out of college was working with draperies at a store owned by the mayor of Chico. A frat brother (Prof. was a Delta Psi Delta) helped get him the interview. But the shop was too small for Prof.’s ambitions. So he moved to Oakland and got into the insurance business and began bouncing from one office to another. “In that I had a degree in business, they’d give me a sick office,” Prof. explained. “I’d build it up, and then they’d take it away and give me another sick office. “They moved me five times in two years and I got sick of it. And they wanted me to open up another office down in south Oakland or some place. So I told them to stick it,” Prof. said. He returned to Chico and went to work at a flooring shop. 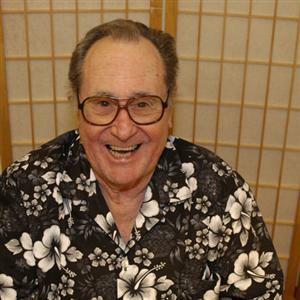 In the late 1960s, he was helping Prof. Estes teach at his dojo, the Chico Judo & Jujitsu Academy, housed in Chapman School. Two of their students, Bud Fuller and Kitty Smith, founded Nibukikan on Oroville Avenue in about 1968. In April 1972, they left Chico and turned the dojo over to Prof. He turned it into a home away from home for many of us. At one point, he recalled, he had a dozen brown belts on the mat. In 1979, five of his students passed black exams. “When I had the club there, I had at least one black belt every year,” Prof. noted. Asked what advice he would give to those coming behind him, Prof. said, “I don’t know how to answer that. I don’t know. I guess the only thing I can say is work hard. Keep it straight. “I don’t know whether you understood what I said at [the 2004] convention [banquet] or not. But most of my feelings were for the young people. And I wanted them to understand that there’s more to life than just getting up in the morning and putting on your pants. And that was my — hopefully — that was my meaning. I don’t know how it came across. “My thinking was, hey guys, there’s a lot out there for you to understand, to learn, if you want to learn it. That’s what I was trying to put across. I hope it makes sense. Prof. recalled the great many people who attended the funeral of Prof. Estes, who died in 1981 while teaching a seminar in Ithaca, N.Y. When told that he, too, is beautiful, Prof. shrugged it off. “Well, I don’t know about that, but I have had the opportunity to touch a lot of beautiful people. And that means a lot to me. And I tried to put that together at the convention. I hope they understood my feelings. Reprinted from an article written by Dan Browning in the Summer 2004 issue of the Kiai Echo, Journal of the American Judo & Jujitsu Federation.